Gordon Collis was a gifted key position player whose injury-hit career at Carlton was highlighted by one magnificent season in 1964. Overall, the Blues achieved very little that year, but Collis was hailed as the game’s outstanding key defender when he was an emphatic winner of the most prestigious individual award in the game; the Brownlow Medal. Three years earlier, Collis had actually signed to play with Fitzroy, before his plans were unexpectedly changed for him at the last minute. Solidly built, yet agile and a brilliant overhead mark, Gordon had starred at centre half-forward for his local club Healesville throughout the 1960 season, and both Fitzroy and Carlton were intent on getting him into their colours. So it was that shortly before Christmas of that year, Carlton committeeman George Woodward dropped in to see Collis at his home, and was taken aback when the 19 year-old told him that he had already signed registration forms provided by Fitzroy. Woodward asked to see the documents, and promptly tore them up in front of a startled Collis. “These are no good,” said George, who produced another set designating Carlton as Collis’s destination, then used all of his persuasive powers to convince the youngster to put his signature to them. Later that afternoon, while driving back to Melbourne with Collis’s papers safely in his keeping, George passed the Fitzroy representatives; on their way up to Gordon’s house, and a huge surprise. Collis was allocated guernsey number 17 at Carlton and began his senior career on a half-forward flank (somewhat ironically, against Fitzroy) at Princes Park in round 2, 1961. His team edged out the Maroons by five points in a willing contest, and Gordon kicked his first goal to get his career rolling. Eventually, his debut year produced 17 games, 12 goals and lots of encouragement, although the Blues marked time somewhat, and ended up eighth on the 12-team ladder. 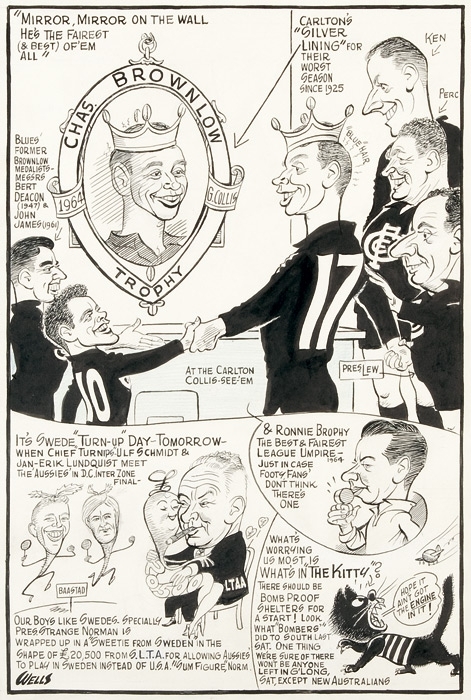 There was a definite improvement in 1962, when Carlton clicked as a team and fought their way into the finals in a solid fourth place. A narrow Semi Final victory (by two points over Melbourne) preceded a sensational draw with Geelong in the Preliminary Final. Collis’s season then ended prematurely when he was omitted from the side for the replay. The Blues went on to defeat the Cats by just five points in another cliff-hanger, but were in turn comprehensively beaten by Essendon in the Grand Final. Collis’s third season in 1963 was really only notable for what happened afterwards. The Blues dropped back out of finals contention to finish sixth that year, with Collis a solid, but by no means dominant contributor in 15 games that produced 14 goals. About then, Gordon realised that his judgement when flying for the ball wasn’t what it should have been. “All the other chaps would be coming down as I started to go up,” he later explained; and that led to him consulting an optician. When he was diagnosed as short-sighted, Collis was fitted with contact lenses – two small pieces of composite plastic that literally changed his life. During the 1964 pre-season trial matches at Princes Park, he was sent to play at full-back, and with his new, clearer vision, took to the role like he was born to it. He was a revelation on the last line of defence, and although the Blues won only one of their first five games, Carlton supporters took him to their hearts for his grit and composure under pressure. However, what was shaping as a break-out season for Collis was almost ruined in round 6, when Carlton travelled to the Junction Oval to take on St Kilda. The Blues were hammered by 48 points, and Gordon was reported for striking Saint Alan Morrow. To his enormous relief, Collis was found not guilty by the tribunal three evenings later - a decision that paved the way for the defining time of his football career. On the following Saturday afternoon at Princes Park, Carlton coach Ken Hands switched Collis to centre half-back against Fitzroy, and Gordon responded with a best on ground display in a desperately close 1-point victory. 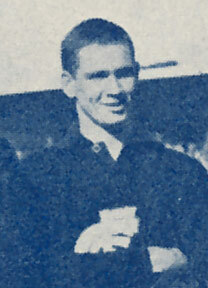 From then on, the Navy Blues won only three more times all season, while Collis was a model of consistency in the heart of the Carlton defence. Although the Blues faded to tenth by season’s end, Collis wound up a stellar season as the raging hot favourite for the Brownlow Medal, and just about every other award going. Sure enough, on Brownlow night, Collis streeted the field with 27 votes – a mammoth eight ahead of Ken Fraser of Essendon, and Phil Hay of Hawthorn. Of his 17 matches in 1964, Gordon polled Brownlow votes in 11 of them – including no fewer than seven three-pointers as best on ground. And just to add icing to a very big cake, he won Carlton’s Best and Fairest award in similar fashion – polling 221 votes over the year to finish well ahead of Ian Collins (181) and John Nicholls (135). If Collis’s rise to football stardom was meteoric, then his decline afterward was equally as spectacular. Amid the excitement generated by the appointment of Ron Barassi as captain-coach of Carlton in 1965, Gordon played the first three games of the season, before suffering an ankle injury that sidelined him for nine weeks. In his absence, another former Healesville boy in John Goold seized his chance at centre half-back, and from then on, Collis found it near impossible to claim his old spot back. Barassi employed Collis as a centreman in the latter part of the year, before Gordon broke down again with stress fractures in his feet. Complications then arose, and he was unable to play at all in 1966. When he did eventually get back onto the park in 1967, he showed that he was still capable of playing an influential role, and the Blues bounced back into finals contention by finishing second on the ladder to Richmond. Although it was rumoured at the time that Collis was suffering badly from stomach ulcers, his eye-catching efforts in both of Carlton’s losing finals matches in ’67 gave Blues fans a lot of encouragement. At least until Gordon’s surprise announcement a few weeks later that he was retiring from VFL football - with 95 games to his credit, yet still a couple of months shy of his 27th birthday. In doing so, Collis became the fifth Brownlow Medallist to date to finish their careers on less than 100 games - the others being Colin Watson (St Kilda), Dinny Ryan (Fitzroy), Brian Gleeson (St Kilda) and Graham Moss (Essendon). In 1987, twenty years after his last match for the Old Dark Navy Blues, Gordon Collis was again honoured when he was one of nine foundation inductees into the Carlton Hall of Fame. In a joyous celebration of our club’s proud heritage - at the culmination of yet another Premiership year - Gordon’s name was enshrined in club history alongside two other Brownlow Medallists in Bert Deacon and John James, as well as immortals Rod McGregor, Harry ‘Soapy’ Vallence, Horrie Clover, John Nicholls, Alex Jesaulenko and Bruce Doull. Contributors to this page: Jarusa , Bombasheldon , PatsFitztrick , molsey , WillowBlue , thehalford , pblue , true_blue24 and admin . Page last modified on Tuesday 23 of May, 2017 23:52:02 AEST by Jarusa.